Today is perhaps the best day for us to remember Martin Luther King Jr. and the message and example he gave to the world. With the realities of war and poverty looming in the world along with the more particular tragedy of the recent earthquake that struck Haiti still fresh in our memories, it's important for us to stop and reflect on the way we respond to the suffering around us. We have the opportunity to offer either cynicism or love to the world. We can respond to Haiti with hopelessness or with love. We can respond to war either with oppositional love and revolutionary peace or with the rigid so-called "realism" that perpetuates war with false concepts of redemptive violence. 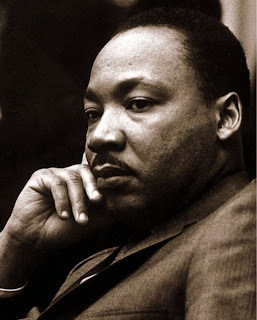 King had as much reason to be cynical as anyone yet he courageously proclaimed, "...right, temporarily defeated, is stronger than evil triumphant." This is what we've learned from Christ on the cross; even when doing what is right seems "ineffective" or like it has been defeated so that we should settle for less and give-in to the fear of death, we are resurrection people with resurrection hope, we are those who refuse to settle for anything less than the kingdom of God. Because we have this vision of resurrection beyond the cross, because we have the eschatological imagination to see beyond defeat and "ineffectiveness," we have the freedom to love beyond hate and hope beyond dire circumstances.